Armory Pack (Fog) is rated 4.5 out of 5 by 13. Rated 5 out of 5 by Bella from I have not gone a day without this since i purchased it I moved to the Netherlands a few months ago, knowing I would be commuting an hour each day by foot, train and bicycle. This backpack has been with me every single day. It is perfect for carrying my computer, and extra jacket and pair of shoes, picking up groceries, or to take with me on a weekend trip. On top of that it is basically waterproof, and has kept my computer dry during intense Dutch rainstorms! If there were one or two extra pockets in the main compartment that would have been nice, but with that said, it I lost my backpack tomorrow I would replace it with the same one the next day. I LOVE this backpack. Rated 1 out of 5 by Joshneedsanewbackpack from Not worth it I bought the fog colored backpack because it stated it was more water resistant. I haven't even had it for a year and the backpack is peeling all over and my stuff inside my backpack were soaking after a light drizzle. I liked the backpack and i got conpliments for it. The backpack is very spacious and has convenient pockets. But with the peeling it looks like a knock off. Don't waste your time. Rated 4 out of 5 by Philly from Good but could be much better The bottom part of the bag does not have enough padding to reliably protect electronic equipment, or any fragile objects from drops and falls, and the laptop compartment inside the main compartment would have been better if it was either sewed to the sides instead of the back part of the bag, or have it be able to stretch. Rated 5 out of 5 by Jordan the Bag Addic from A bag addict that may have found the cure This is hands down my most favorite bag I have ever owned. I use it as my EDC, my bike commuter, and my weekend bag. It has a very low profile yet is incredibly spacious. I can easily pack my computer (Mac Pro 13"), change of clothes, shoes, travel towel, and toiletries in it for when I bike to work. When not carrying shoes I can get 2-3 days worth of clothes inside for weekend get-a-ways. The storage actually extends above the zipper which is nice for not having to shove those last few things in when it's fully loaded. It is insanely waterproof, not sure about the zippers, you wouldn't want to submerge it, but I have no hesitancy about wearing it through the rain on my way into work. Side pocket easily fits a 32oz Nalgene. Opposite side is great for headphones and GoPro. There isn't a lot of pocket storage but what it does have excels. I did end up buying a small case for cables and random knickknacks that there aren't pockets for - mostly GoPro accessories though. Rated 5 out of 5 by Ringo from versatile - good for in- and outdoor activities This one was an impulse buy, and I'm glad I gave in to impulse. It's another one that's good for people with narrow shoulders - I took it snowshoeing, with a down jacket, lunch, water bootle and some other stuff inside, and it never felt overly heavy. I've been carrying it to work with my computer and stacks of papers, and it's heavy, but so compact that the weight doesn't bother as much as I'd expect. It carries much more than I'd expected without being bulky. This bag is very well-designed. There are pen slots in the front, two sleeves inside which are great for holding a computer and a tall folder. I've never been one for bags with lots of pockets and compartments, but the pockets all make sense and are useful in this bag. The attention to detail is impressive. I love that the lid zipper opens toward the back - so smart for security. My only gripe is that that top zipper doesn't always zip smoothly - it catches on the corners a little, and needs two hands. Pretty minor complaint, though. Rated 5 out of 5 by Brandon from Sleek medium size backpack! I searched and searched for the perfect backpack. I had to figure out what I loved about my 3 different bags so I could buy 1 to replace them. (I am downsizing my life) The Armory bag was my final choice. I was looking at every brand and even custom made bags. My needs are vast as I am a guy who carries lots of personal things (headphones, laptop, phone, chargers, book, journals, pens, wallet paperwork, water bottle, snacks, sunglasses and reading glasses), Plus my two kids need to be accommodated when we are together and they come with their own set of items, most important of all snacks, diapers, and wipes. My bag life before the Armory bag basically had me forgetting something, somewhere, almost every day. I had my work bag, my dad bag, and my EDC bag. Something did always make it in the switch. I would forget my wallet in my dad bag but was at work trying to buy coffee. I hope you get the picture. Now my daily life can fit in my Armory bag. There is enough room to cram a whole day of adventure items for 3 people while being sleek (when not full of stuff) and stylish enough to take to work. One of my co-workers already asked if I minded if he purchased one, not at all Daniel just not the same color ok! 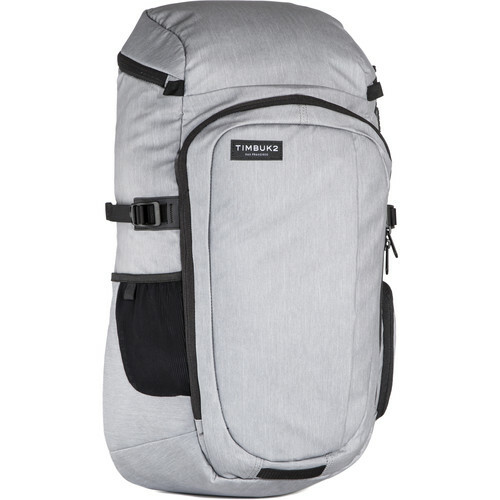 Timbuk2 hit it out of the park on this sub $120 bag. My only negative about the bag is the green color is more of a grey. That was an initial bummer as I was really hoping for it to be green but the color is still nice. Also, the security zipper could be improved. If the two parts that accept the lock could overlap or if they were a male/female style that would be nice. Other than that, I think most people would be happy with this bag. Rated 5 out of 5 by Traveling Grad from Perfect pack for travel excursions Purchased this pack for class and for travel, most notably my recent trip to Singapore. What a perfect pack to get around an amazing city and for my weekly classes. Comfortably fits my Mac Book Air, an iPad, a rain jacket and all the essentials I need to go from A to B and everywhere in between. It's great looking an really comfortable. This is my third Timbuk2 bag and won't be my last.